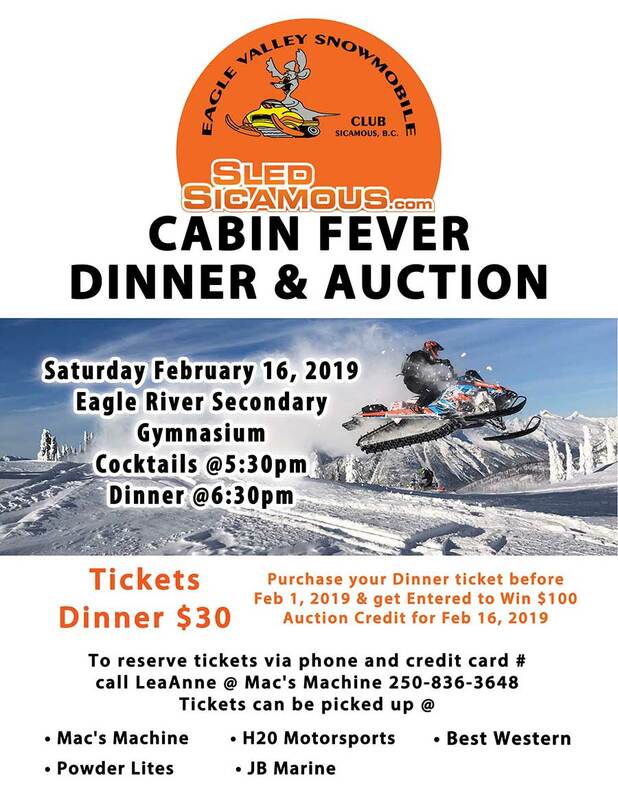 The Eagle Valley Snowmobile Club is hosting our annual Cabin Fever Dinner, Dance and Auction at the Eagle River Secondary Gymnasium. Tickets $30. Purchase your ticket before Feb. 1st, 2019 and be entered to win an auction credit of $100 for Feb. 16, 2019. Tickets via phone and credit card #. Call Leanne at Mac’s Machine 250-836-3648. Pickup tickets at Mac’s Machine, H20 Motorsports, Best Western Sicamous Inn, Powder Lites and JB Marine.